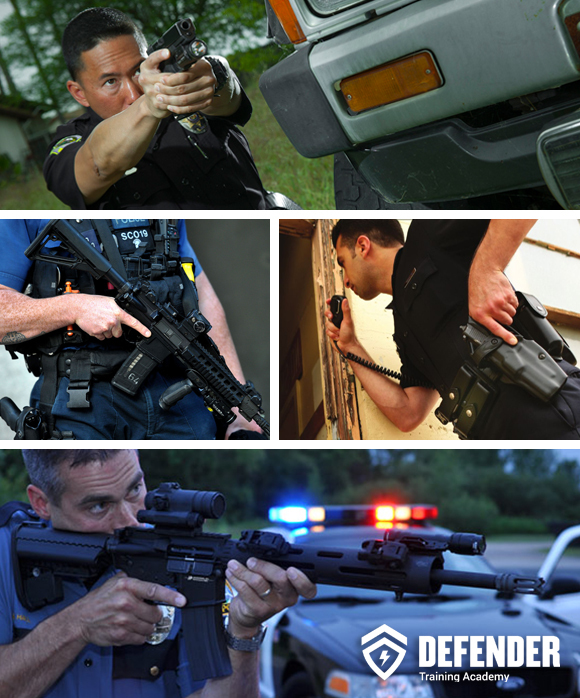 Defender Training Academy provides comprehensive tactical training courses for law enforcement and security companies. Building on the latest tried and true tactics from instructors with combat proven skill sets as well as law enforcement professionals with years of experience we can develop custom courses to suit your specific needs. Our primary objective is to pass on to your team the shooting techniques and decision making skills they will need in order to operate and survive deadly force encounters. Below are a few course descriptions of training now offered to Law Enforcement and Security Companies from Defender Training Academy. In this course we work with officers in drawing their weapon under stress, engaging multiple threats as well as working through malfunctions and reloads. In this advanced course officers will learn how to shoot on the move, how to best utilize cover and concealment to their advantage as well as preforming one handed reloads from their strong side. The carbine rifle (patrol rifle) is becoming a much more necessary tool in this day and age. This course will prepare officers for qualifications as well as advanced tactics with the patrol rifle.